I have complained many times in the past the ugliness of Zecco’s interface. Not just because of its main color is gray, but also it’s difficult to use in general. 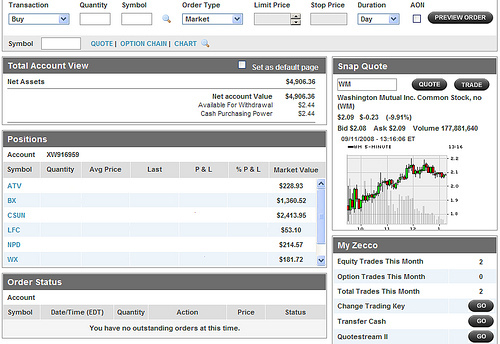 Among the brokers I am using now or have used in the past, Zecco’s interface is probably the worst. Every time I use it, I kind of tell myself this is actually the price I have to pay, though I don’t pay a penny to buy stocks (check out Zecco review if you are not familiar with it). Then when I logged into my Zecco account yesterday, I noticed something different. Something new. Yes, they did a little improvement on their trading interface. Not a big deal, but the improvement does make the interface easier to use. The new additions are the two blocks on the right: Snap Quote and My Zecco, and one block at the bottom: Order Status. Before, a new page comes up every time I type in a symbol to get the quote and I can only see the quote, nothing else. I have to go back and forth between the quote page and the page showing my positions. Not very convenient. Showing the number of trades made in the month is also convenient to users because Zecco limits the number of commission-free trades to 10 per month. It’s better to know the how many I still have from the site right away, instead of having to go to the record and count how many I have used already. I hope Zecco keep making improvements on their website to make it more user friendly. I hate it when things ars difficult to use.